BRYN MAWR, Pennsylvania -- The American College of Financial Services today announced that Wade D. Pfau, has been named Director of The American College's leading Retirement Income Certified Professional(R) (RICP(R)) Program. Pfau will also now serve as Co-Director of the New York Life Center for Retirement Income, joining Steve Parrish, as Center Co-Director. Pfau has been with The American College since 2013 and is a Professor of Retirement Income in the Financial and Retirement Planning program and has been a core contributor to The College's RICP(R) designation program curriculum. In his new roles, Pfau will be responsible for leading and advancing the Retirement Income Center and its RICP(R) courses and curriculum, while closely tracking market changes and industry trends to keep the designation program relevant for all types of financial professionals. The American College is strengthening its RICP(R) designation program to reflect the changing needs of the retirement advisory marketplace and the evolving dynamics that can impact retirement income plans. This move is part of The American College's continued effort and mission to serve the financial services community across the board, and to elevate the retirement income planning knowledge of financial service professionals to improve retirement security for all Americans. "Knowing how to create and manage thoughtful, well-designed retirement income plans is becoming essential for advisors as more Americans move into retirement and live longer than ever once retired," said George Nichols III, president and CEO of The American College of Financial Services. "Our focus is on continuing to enhance The College's role as an unmatched provider of retirement income knowledge and education. To that end, Wade is a world-renowned retirement income expert who has done groundbreaking work on the topic, and he has been a powerful driver of our RICP(R) curriculum since inception. He is incredibly well-placed to further evolve and improve the indispensable retirement income education that The American College provides for advisors throughout the financial services space." Pfau's entire career has been focused on developing unique new research dedicated to understanding and overcoming the retirement income challenge. From 2003 to 2013, he lived in Japan, where he worked with the National Graduate Institute for Policy Studies and published a landmark paper challenging the 4 percent rule. His research on the 4 percent rule has had a lasting effect on the industry and he was awarded the Journal of Financial Planning's inaugural Montgomery-Warschauer Award for his paper on the topic. Pfau holds a doctorate in economics and a master's degree from Princeton University, and Bachelor of Arts and Bachelor of Science degrees from the University of Iowa. He is also a Chartered Financial Analyst(R) (CFA(R)). The American College also named Colin Slabach as Assistant Director of the New York Life Center for Retirement Income and an Assistant Professor of Retirement. In these roles, Slabach will continue to develop The American College's retirement programs, teach courses, and ensure delivery of the highest quality professional and advanced education programs and services to The American College's students. He will also support Pfau and Parrish in leading the Retirement Income Center. Slabach will assume this role over the summer. Slabach joins The American College from the faculty of Texas Tech University. He holds a master's in Personal Financial Planning from Texas Tech and bachelor's in Business Finance from Eastern Illinois University, and is currently a doctoral candidate at Texas Tech. 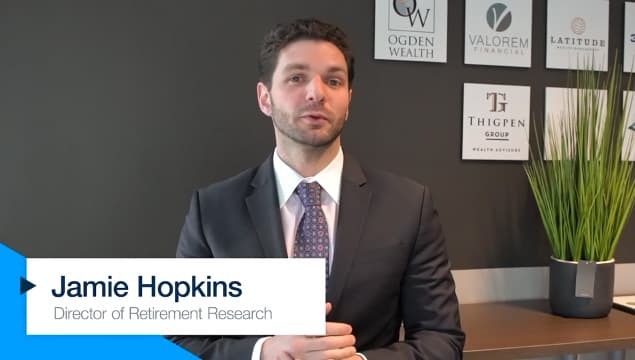 "Colin is a dynamic young talent and a bright light in the retirement income space," said Nichols. "He will bring even more energy and insight to the retirement income program as it continues to serve a growing number of financial advisors who are focused on helping people tackle these thorny retirement challenges." Following a long career of teaching and leadership at The American College, David Littell, JD, ChFC(R), a creator of the RICP(R) designation, will move to working with The American College in a part-time capacity as senior contributor to the RICP(R) program and a mentor to College faculty and students. "Dave has been a mentor to many during his two and half decades here, and his influence has made an indelible impact on our students, staff and organization overall," Nichols added. "I want to thank Dave for all he's done for the development and progress of RICP(R) program at The American College, and we are thrilled that he will continue to be a key contributor to our industry-leading work in the retirement income space." These appointments come on the heels of two major recent staff announcements at The College made by Nichols who became president just five months ago. Chad Patrizi, PhD, has been named executive vice present and provost at The American College beginning May 1, 2019. This newly created position will be the second-ranking administrative officer at The American College. He joins from American Public University System, where he is currently vice president and dean of the School of Business. In addition, Stephen J. Grourke, CAP(R), CFRE, was recently named as senior vice present for advancement and alumni relations beginning April 1, 2019. Grourke comes to The American College from Villanova University where he served as executive director for the Office of Estate and Gift Planning. He brings two decades of experience working in advancement, most recently as part of the senior team that led Villanova to secure $760 million during its most recent and largest comprehensive campaign, while growing the alumni giving rate to 30 percent. "Across the history of an institution that has been providing high-quality education for financial professionals since 1927, this is a notably outstanding new group of faculty, staff and leaders that brings a tremendous infusion of energy, talent, experience and vision," said Nichols. "We welcome them all and can't wait to see what the future holds now that they're on board."